Hi there! Welcome to the first day of the May Neat & Tangled release countdown! All of the new products will be available in the Neat & Tangled Store on Friday May 5th at 8:00 am EST! The first set we are showcasing is the Triangle Pattern Builder! I had fun creating a very modern graphic style card. I used my MISTI to stamp the triangles so I could sponge the ink on to get the ombre effect. I just randomly stamped the triangles in pink, orange and yellow ink. I added the white leaves from the Flower Medallion Builder dies. 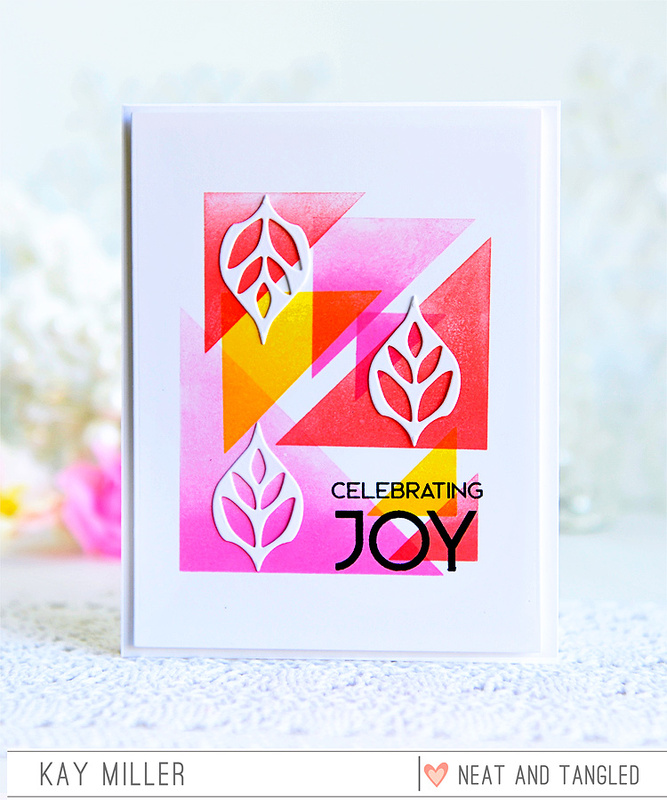 The sentiment I stamped with black ink and it's from a new set that will be available with this new release called Art Deco Background. Be sure to check out the Neat & Tangled Blog to see some more wonderful inspiration from the Design team! Neat & Tangled will be giving away a Triangle Patterned Builder stamp set, just leave a comment to be entered! This is fabulous, Kay! I love the colors and the graphic design! Oh, the leaf shapes are terrific and oh yes, celebrate joy! Just and wonderfully vibrant and colorful card. Thanks so much for sharing! Hugs! Happy Week, my friend! Such beautiful, bright, happy colors. Love this. Beautiful Kay! Your design talent is amazing! Gorgeous colors and the black...so strikingly beautiful! Oh my stars! The triangles, the colours, the white leaves, the sentiment: a WOW combination in every way! Striking, stylish and gorgeous! Good morning Kay! Oh my goodness this could not be more beautiful! Wow the design is just amazing! btw I can't wait to get my mail today I should have( should have come last week) that fun Cuddly Cat die in my hands! Beautiful card Kay! The triangle builder looks so fun. I love the color combo you used here! What a cool card, Kay!! Love the overlapped triangles and those leaves are awesome! Going to have to give your technique a try----oh, that means I have to get the Triangle and Flower builder sets! Thank you, Miss Enabler---LOL! This was my favorite card with the graphic design. thank you for the tutorial; love the leaves die. Beautiful. Love your color choices Kay. Lots of wonderful white to surround the great colors. Thanks for sharing. I will be checking Neat & Tangled blog. Kay - so graphic and so awesome. Love the color palette! Oh my word, this design was made for me! I love color, I love geometric design and I love this card. This Triangle Builder is on my list for sure! Thanks for sharing! As always, an amazing card. Thanks for the inspiration! Very pretty card and design!! I like the cheery colors and design. I gasped when I saw this on IG! Had to come here for a closer look! 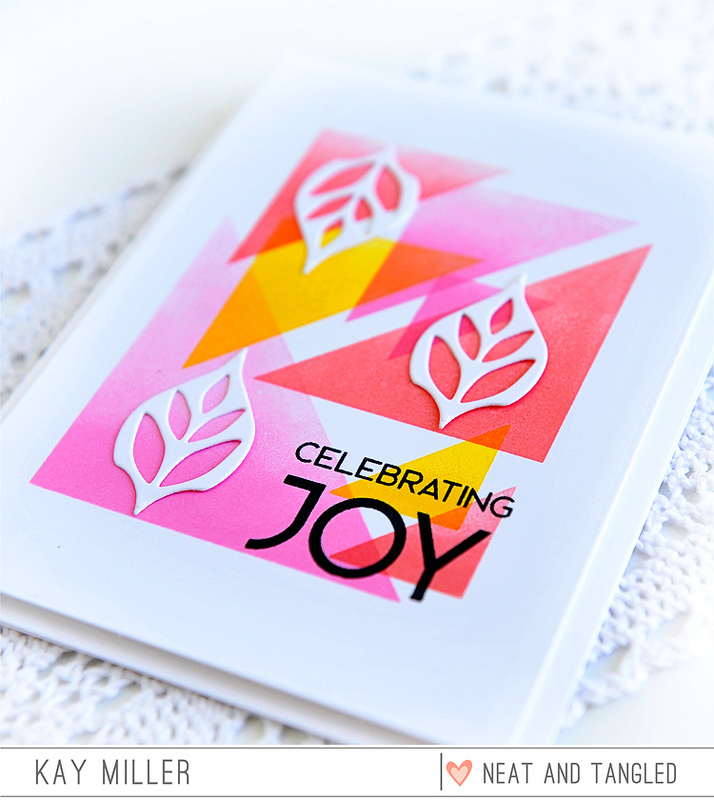 I love the graphic punch from the triangles--a must have set! Gorgeous graphic design! Love the colors and the white leaves! So bold and graphic! I love this, those medallion flower dies are a perfect addition! Love those triangles! Pretty colors! Wow! Beautiful card and colouring!!! This triangle builder set is great! I can see using it over and over for any occasion! Love the color combo on your card! 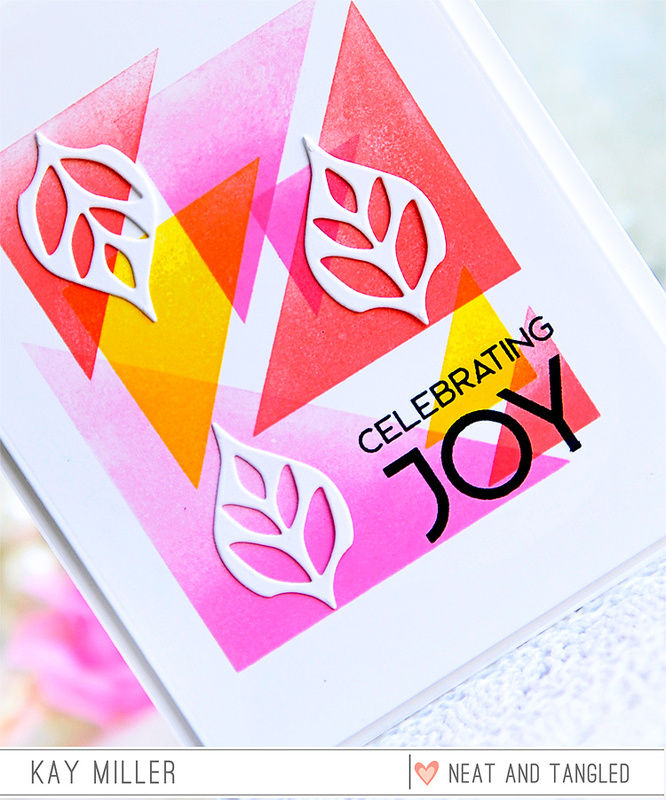 This is such a versatile stamp set and you've made a truly beautiful card with it. Wow, this card is so striking, with the vibrant colors and gorgeous background! So in love with your card. I could look at this for hours, Kay, it is so beautiful! Love the crisp clean lines and the way the colors overlap. Fabulous! Love the card. These triangle stamps are going to be fun to create with. This is different than your usual style, but still just as amazing! Pretty card!